"Middle East in Turmoil: Syria's Destiny? " Roula Khalaf is Deputy Editor of Financial Times. She has worked for the FT since 1995, first as North Africa correspondent, then Middle East correspondent and most recently as Foreign Editor. Before joining Financial Times, she was a staff writer for Forbes magazine in New York. Before joining Financial Times, she was a staff writer for Forbes magazine in New York. 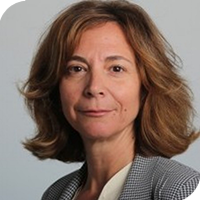 Roula oversees Financial Times’ network of foreign correspondents and bureaus. She writes regularly on global politics and business. Her series on Qatar won the Foreign Press Association’s Feature story of the year in 2013. She was named foreign commentator of the year at the Editorial Intelligence Comment Awards in 2016. She is a graduate of Syracuse University and holds a Masters in International Affairs from Columbia University in New York.